Old villa with a lot of charm of the 70s and 80s, transformed with important renovations to become a luxury villa of 547 m2 quiet, peaceful and charming. 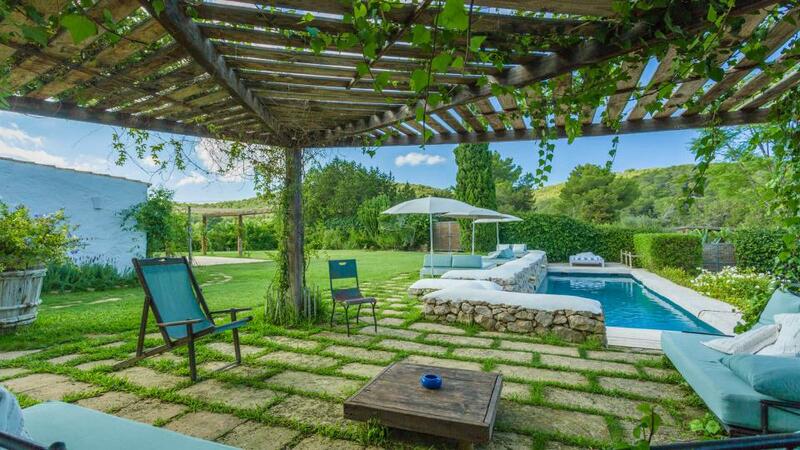 Villa located on a plot of 17,000 m². Room, Ground level. This bedroom has 2 twin beds configurable as a double bed. Bathroom ensuite. This bedroom includes also private terrace. Suite, 1st floor, direct access to the terrace. This bedroom has 1 double bed. Bathroom ensuite, With bathtub. This bedroom includes also TV, DVD player, dressing room. Suite, Ground level. This bedroom has 1 double bed 200 cm. Bathroom ensuite, With bathtub. Suite, Ground level. This bedroom has 1 double bed 200 cm. Bathroom ensuite, With shower. This bedroom includes also dressing room. Suite, Ground level. This bedroom has 1 double bed 180 cm. Bathroom ensuite, With shower. This bedroom includes also private terrace. Many terraces and relaxation areas. The beautiful beaches of the North-East coast are located between a radius of 10 km: Cala Llenya, Cala de Boix, Cala Mastella, Aguas Blancas, Cala LLonga ... ..
Cala Tarida where our local offices are located is 30-35 minutes away by car. Ibiza town at 15 - 20 min. By car.